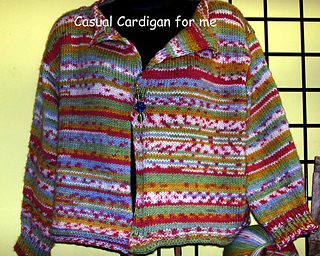 This very easy cardigan, with three-quarter length sleeves, is light as a feather and a delight to wear on spring days or cool evenings. The draped front overlaps slightly or may be closed with your favorite pin. It is worked from the bottom up, in one piece, with shoulder seams, and has narrow ribbing at all edges. Sleeves are worked in the round from shoulder to cuff, and gently shaped with a decrease panel down the top of the sleeve for a sleeker fit.